If your data, services or processes become compromised, your organization can suffer irreparable damage in just minutes. The clock is ticking, and how fast you communicate during a major IT incident is everything. 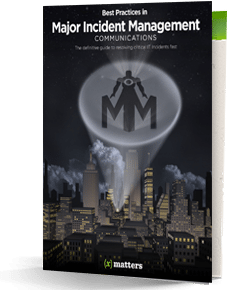 Grab the Best Practices Guide and learn how to immediately identify a major incident and use best practices for automating the communication process to resolve it quickly and effectively.